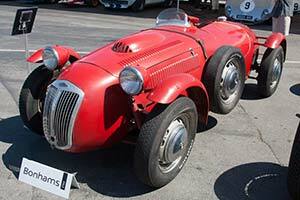 The second Mk2 Le Mans Replica built, this example was shown at the 1952 Earls Court Motor Show. It was soon after acquired by American Frazer Nash agent Stuart 'Duke' Donaldson. He had entered the Sebring 12 Hours winning Le Mans Replica in 1952 and pursued another victory in 1953 with his new Mk2. Sadly the clutch failed after just ten laps. The car would go on to be actively raced for many years and at one point, the engine was moved six inches back to improve the handling. In 1959, it was sold to George Waltman, who continued to race and show the car with great verve. He cherished the car until his death in January of 2013 and as a result, it remains in highly original condition. From his estate, it was offered at Bonhams' 2014 Quail sale where it found a new owner for just over $1 million.